Sarcopenia is the term used to describe the loss of muscle mass and associated weakness and decreased coordination as we age. 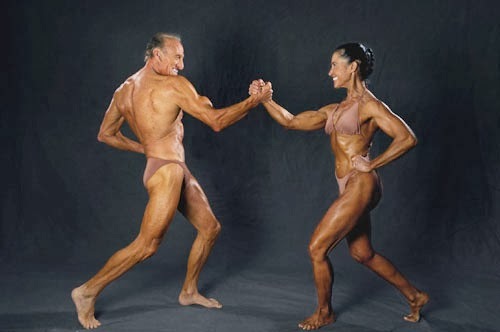 We start losing muscle mass after about age 50, at an annual rate of 1-2%, eventually losing up to 50%, which can explain the decreased athletic performance as we age. Starting even earlier, fast-twitch muscle fibers are gradually converted to slow-twitch fibers (called motor unit restructuring), which decreases muscle strength and makes our movements less powerful and precise. Muscles are made up of proteins, and since our bodies don’t perfectly replicate every new protein, we gradually lose some muscle functioning. Two growth hormones and the hormone testosterone, which all help produce and synthesize protein, decline by about 1% per year after the age of 40. The loss of these hormones is linked to a loss of protein and a decline in both muscle mass and bone density. 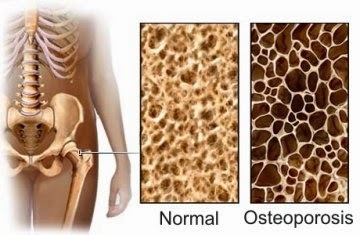 Men have a lower risk of osteoporosis (“thin bones”) than women, though they, too, lose bone calcium as they age, increasing the risk of fractures. 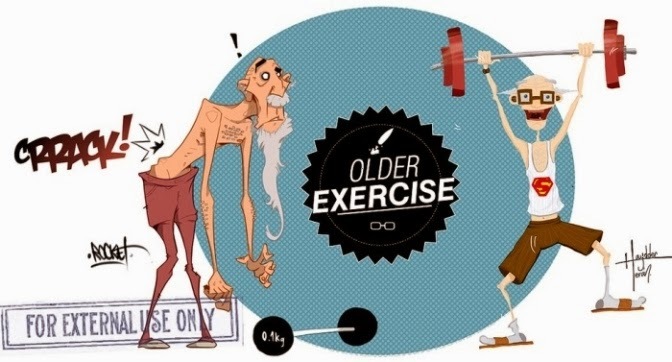 People of all ages can build muscle size and strength through resistance training, but older people need to maintain their workout frequency and intensity more than younger ones if they want to maintain muscle mass. Sounds unfair, right? It is. 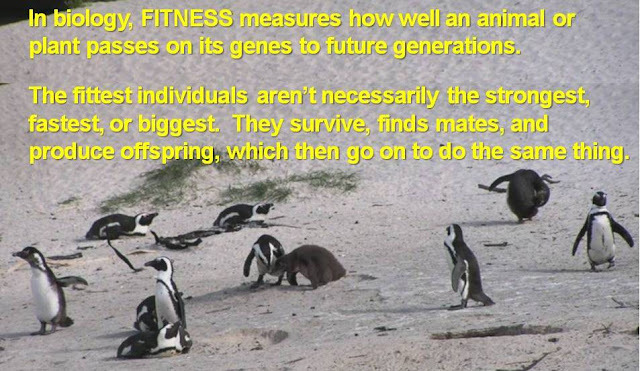 Age-related changes to other systems -- especially our circulatory and nervous systems -- are equally dramatic (and improved by exercise). For example, as early as our late 20’s (!! ), our heart’s peak capacity to pump blood declines by 5%–10% per decade. No wonder we get more winded as we age: a healthy 25-year-old heart can pump over 2 liters (2½ quarts) of oxygen a minute, but a 65-year-old heart can pump no more than 1½ quarts, and even a healthy 80-year-old heart can pump only about a quart. 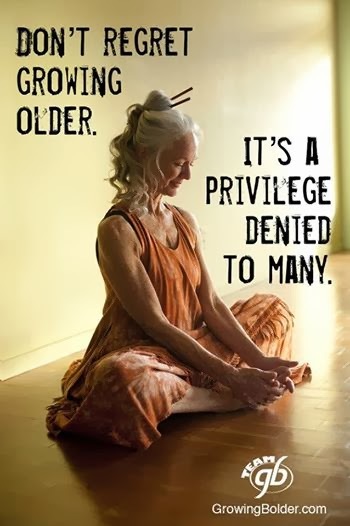 On top of that, in middle age, the heart begins to stiffen and shrink, and it has to work harder because blood vessels lose flexibility and the blood itself thickens. The lower movement of new oxygenated blood to your muscles decreases your aerobic capacity and can make you tired and breathless after even modest activity. Regular exercise helps to slow age-related weakness of muscles and circulation at any point, though the earlier one starts, the better. A test of former top-flight cross-country skiers older than 80 found that their cardiovascular fitness was “comparable to non-endurance-trained men 40 years younger.” All nine athletes had strong, well-conditioned hearts from years of aerobic exercise. 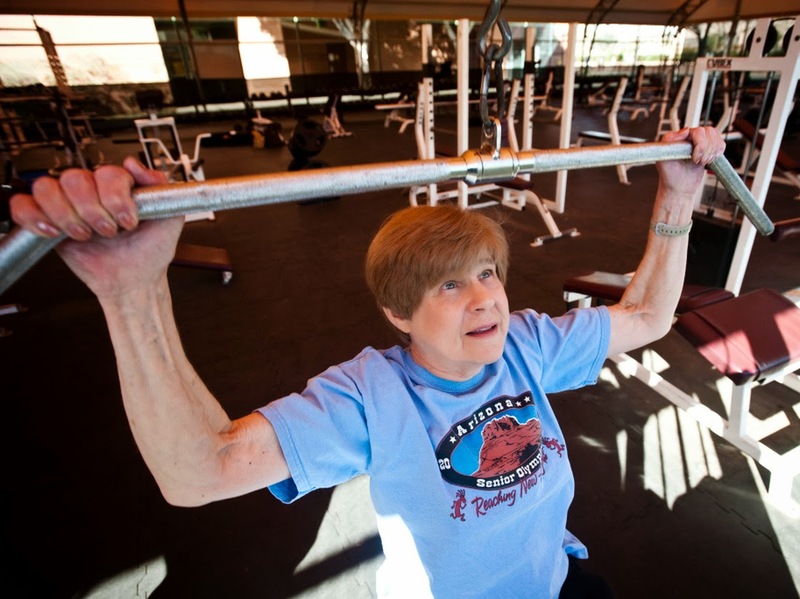 people in their 70s who stayed active tended to have larger brains than those who didn’t. inactive older adults that began a walking program had larger hippocampus regions (involved with memory) one year later than a similar group that began a stretching and toning program. 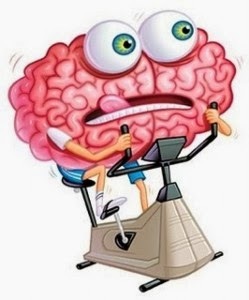 physical exercise, more than mental stimulation, such as doing crossword puzzles, maintains the brain’s size and, presumably, one's memory capacity. studies with mice have shown that exercising regularly helped both young and older laboratory rats to improve their spatial memory and cognitive performance (perception, reasoning, and judgement). Good ol' mice! Not everyone can or wants to do resistance training, and experts agree that sticking to an exercise program is half the battle. If you love a particular exercise and will do it regularly, that suggests you should keep it up. I love to run in Bangkok’s Lumpini Park to watch the many groups of (usually older) people doing various tai chi routines – some use props like fans or swords, and many wear their group uniform. They are out most mornings. My takeaway message from all my research for this post? Harvard Medical School's article on exercise and aging;, which includes this table of the many reasons to exercise and avoid getting old! Using your body will keep it young (table from Harvard Medical School).